Hi there! 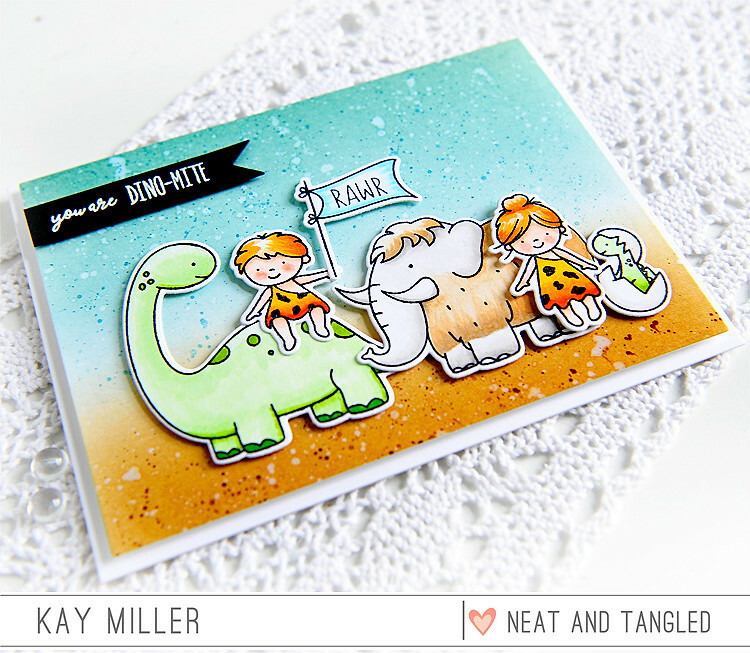 Welcome to the third day of the May Neat & Tangled release countdown! All of the new products will be available in the Neat & Tangled Store on Friday May 5th at 8:00 am EST! Today we are showcasing the new set Prehistoric by Elena Roussakis. OH it is SO cute! First thing I thought when I saw this set was "Pebbles and Bam Bam!" The little cave kids are so cute, and that wooly mammoth, oh he's got it going on! So I created my background with Distress ink on Bristol Board. I blended the colors then speckled some water and then more of the same ink colors. I colored all of the images with Copic markers, cut them out with the coordinating dies, and adhered them with foam tape. I stamped the sentiment with VersaMark and heat embossed with white embossing powder, then cut that out with a flag banner from the Scalloped Dies. Love your card Kay!!! From the coloring and the design.....such a fun and whimsical card! !!! Oh my goodness!!! I’m definitely in love for your adorable card!!! Too sweet and cute!!! Beautiful stamp set!!! This card is sooo cute! Those cave kids are adorable and your background is great! Kay, you and Elena both have it going on. This is adorable. Pebbles was one of my daughter's favorites. Thanks, this is perfect. 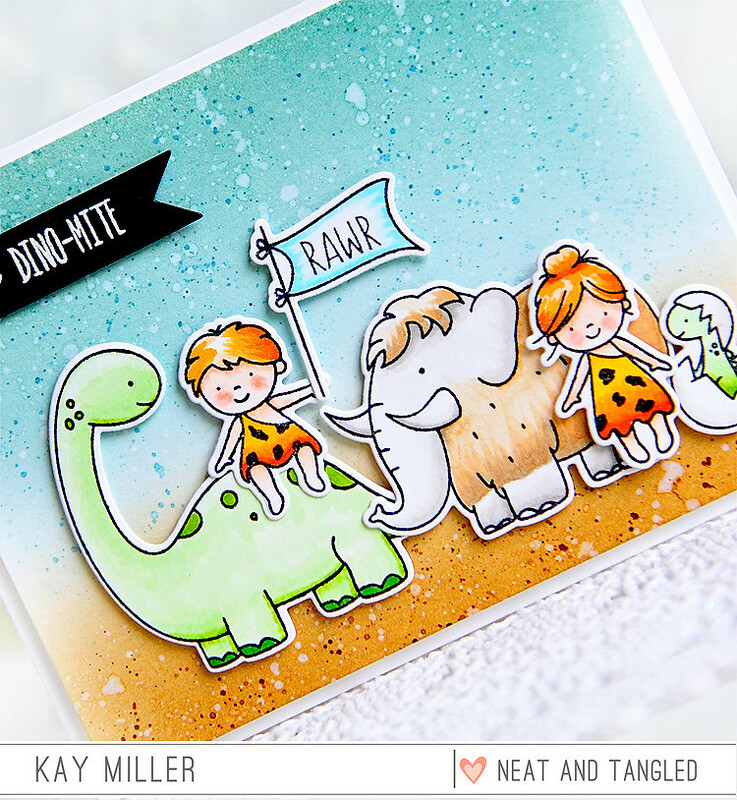 My first thought when I saw this stamp set was "The Flintstones"! I love this sweet scene and your BG is fantastic! So cute!! Love the idea of pebbles and bam bam!! Adorable scene!! Oh, my grandkids would LOVE to get this card in their mail! Love it, Kay! Such a darling card, Kay! Your background is so striking and I love how your coloring brings these sweet images to life, as always! You're right, they remind me of Pebbles and Bam Bam, too! Cute. I like your coloring and the speckled background. Totally adorable! Your coloring is so good and I love the inking/splatter on the background! I love your card! The ink-blended background is lovely, and your coloring of these cute images is fabulous! Love how you colored them!! Cute scene with awesome coloring! Wonderful card! Beautiful coloring! Love the bright colors on these adorable images! Awesome card! 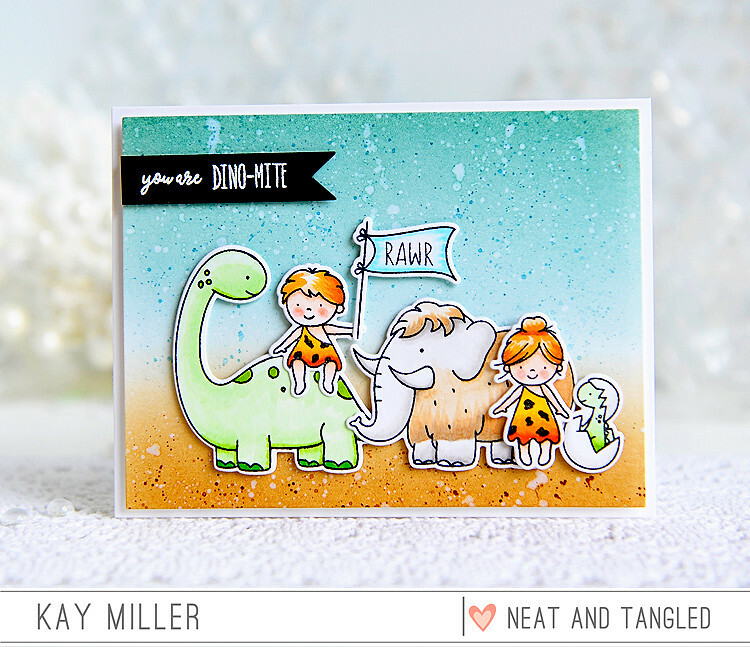 The background is fabulous and is just perfect for this stamp set! This set is so damn cute. Love your card. The background and colouring are all just spot on. That was my first thought, too! Ha, ha! This is a terrific card, Kay! Those images are colored wonderfully. You created a great scene with the inkblended and speckled background. A great showcase for the fun images. Wonderful work, my friend! :) Hugs! Adorable! Fun scene. Love the background you created. This is adorable and love the great design of the card with the images placed just like a parade. Yes, yes, yes!! If this isn't Pebbles and Bam Bam, I don't know what is. CUTE card Kay, love this! !